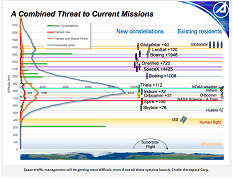 Space traffic management will be getting more difficult, even if not all these systems launch. Logan, Utah - With as many as 20,000 satellites expected to be launched over the next 10 years, space traffic management is projected to become increasingly challenging. To help deal with the coming deluge of small spacecraft planned in low Earth orbit, the Aerospace Corp. is advocating a new approach to tracking satellites in space, one that could rely on a hosted GPS transponder that would help operators reduce costly collision avoidance maneuvers while increasing the predictability of space traffic. To this end, Aerospace is evaluating a concept for such a transponder that could fly as a hosted payload on any intentionally deployed spacecraft, from large communications satellites to smallsats and tiny cubesats and track their movements in orbit, said Ted Muelhaupt, head of Aerospaces's Center for Orbital end Reentry Debris Studies.